Our goal is to ensure that our partner schools have a constant supply of clean water for drinking and cooking. Water is a scarce and precious resource in the remote and semi-arid area in which we work. None of our partner schools have a piped mains supply of water; indeed no such thing exists in the entire community. 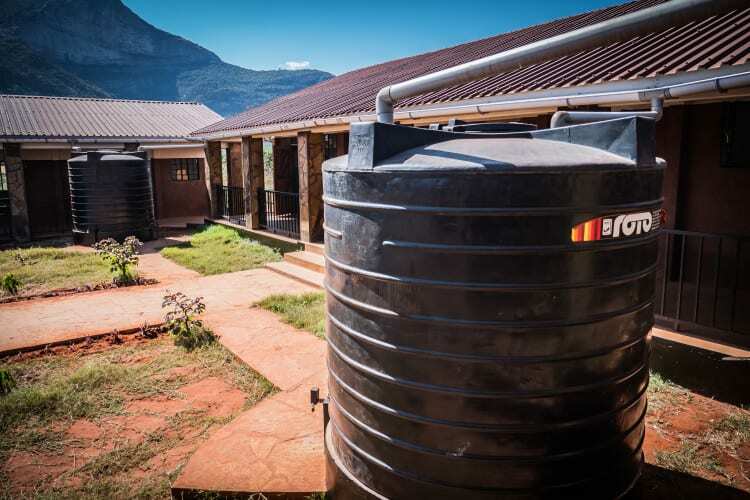 We install high-capacity rainwater harvesting systems that allow our partner schools to collect and store rainwater. At times of drought or during long spells without rain, when reserves of harvested rainwater ar exhausted, we also supply bowsers of clean water in order to maintain a regular supply of water for drinking, cooking and cleaning. Please donate to our Water4All campaign so we can continue to invest in expanding the rainwater harvesting potential in our partner schools and to build reserves to pay for water during times of drought. Your support will help us achieve our goal of ensuring there is no day without water available in any of our schools. What about wells and boreholes? Groundwater in our area is high in salt due to the mineral content of the rocks, often making it unsuitable for human consumption. Furthermore, there are inherrent risks and often unknown costs in drilling for water. We believe that rainwater harvesting offers a more cost-effective solution given the low on-going maintenance and running costs.